'Get lots of compliments' 'Rings are beautiful' 'lovely matching ring' 'Sparkle really beautifully in the light' We have many happy customers shout out how they like this product a lot! This product is the PERFECT solution to your wedding day or gifts for your loved one! Regal Color! Purple has long been considered as a regal color, so amethysts frequently appeared in royal and religious jewelry. It absolutely create an unique look and can please even the most discering jewelry lovers. Classic look! Square cut cubic zirconia cz will not have typical gaps between stones, which will features smaller accent of cubic zirconia which createa a classic look. According toægemstone lore, amethyst jewelry keeps its wearer clear-headed and clever. Artist Leonardo da Vinci wrote that amethysts enhance intelligence and protect against evil thoughts. Artist Leonardo da Vinci wrote that amethysts enhance intelligence and protect against evil thoughts. You risk absolutely nothing. 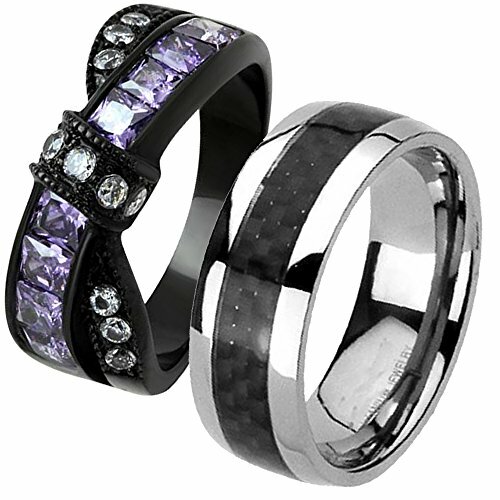 Our Black Created-Amethyst is backed by an unconditional 100% 30 days no-risk, no-nonsense money back guarantee. Your search for "THE ONE" perfect wedding ring set is finally over! With over 15+ fiver star reviews, you can trust that Amazon customers agree. We have a limited supply of this best selling product. Grab yours today from Amazon.com exclusively. UNIQUE DESIGN! Hers ring features sparkling created-amethyst cubic zirconia in a channel setting between metal, great for people preferring for straight line with simple and modernized style. You will like how clean and sleek it looks. Good for marriage rings, engagement rings, promise ring or matching ring, as a not so expensive option. PRACTICAL! Mens band made with Titanium which is very lightweight. You would not feel too heavy and can wear daily comfortably without even noticing it. Features with carbon inlay polished design. RUST-FREE! Both stainless steel and titanium are rust-free, you will be able to get it wet when you are in kitchen or having any outdoor duties. This is great because it will last forever without rusting! GREAT GIFT! Amethyst is a February birthstone. According to ancient Greek, it helps to strengthen relationship and gives its wearer courage, peace and balance. If youÍre shopping for a February birthday girl or your girlfriend, our created-amethyst cubic zirconia ring is a canÍt-miss choice.